There have been increased calls for transport security in recent months. THE DEPARTMENT OF Transport, Tourism and Sport has allocated €115,000 to Irish Rail to provide additional security over the Christmas period. 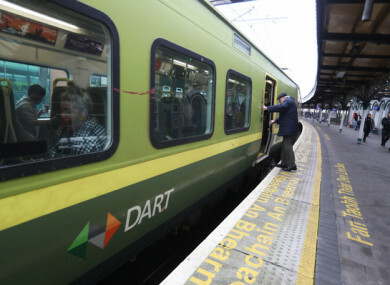 Funding for additional security for passengers, staff and property includes €100,000 which will be spent on extra security patrols on evening Dart and commuter services between Dublin city centre and Howth, Drogheda, Maynooth, Kildare and Greystones, Minister Shane Ross TD has announced. “While the vast majority of journeys occur without incident, I am concerned to ensure that the necessary arrangements are in place to ensure safety on our rail network,” Ross has said. There has been increased concern in recent months following incidents on public transport as well as further calls for a dedicated transport police to protect drivers and passengers. The remaining €15,000 will be used by Irish Rail to provide additional security at fleet-maintenance depots in order to counter the threat of vandalism, including graffiti attacks on trains. In addition to the security funding, €160,000 will be allocated to the Accessibility App project for rail users with disabilities. Aimed at addressing communication problems which occur with the current phone call process, the app allows disabled passengers to pre-book a journey that confirms that they’ll be assisted by an Irish Rail staff member at their departure and arrival stations. Irish Rail has been criticised in the past by disabled passengers who must give long notice periods so that staff can assist them in their travels. The company is currently looking for volunteers who have mobility and vision impairments and who are regular DART users to take part in live testing of the app. Email “Over €100,000 to be spent on security on Irish Rail over Christmas”. Feedback on “Over €100,000 to be spent on security on Irish Rail over Christmas”.